Cities are growing. Rapidly. Currently cities are home to more than half of the world’s population with another 2.5 billion new residents expected to be added by 2050. It’s no surprise then that smart technologies are being looked at as a way to help meet challenges of rapidly growing cities. 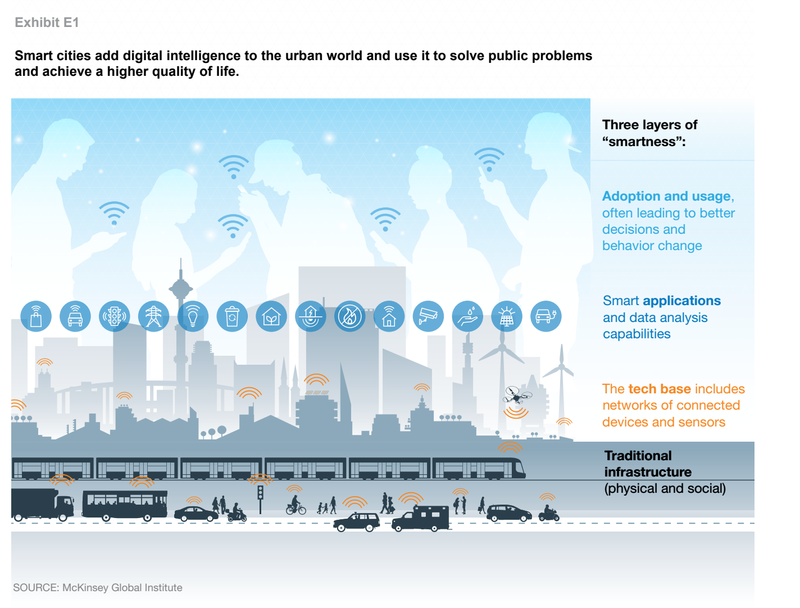 This month McKinsey Global Institute (MGI) released an indepth research report — Smart cities: Digital solutions for a more livable future just in time for the upcoming World Cities Summit happening in Singapore. In the report the explore the topic of smart cities. Below we share our top takeaways from the report. ‘Smart cities’ have arrived. It’s no longer a fad or some distant distant future thinking. 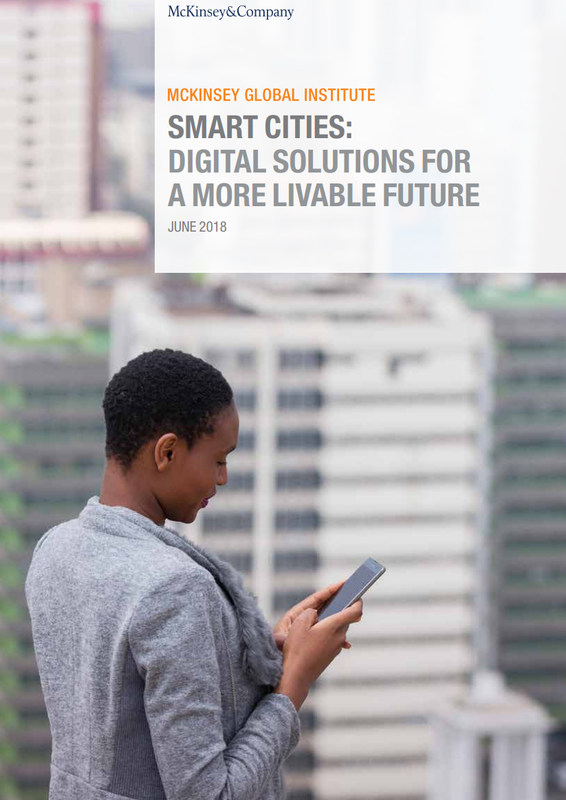 The report outlines how current smart city technologies have unrealized potential with dozens of existing digital applications our there that address very real city challenges and human concerns. Using digital applications according to the report means that cities could “improve some key quality-of-life indicators by 10–30 percent”. Smart cities can enhance enhance social connectedness and engagement by providing new channels for the public to communicate with their government representatives about how they want their city to look, run and be. [ See diagram below for where Snobal is having an impact here]. An open approach to innovation and private-public participation needed: According to the report “60 percent of the initial investment required to implement the full range of applications could come from private actors”. What does this mean? Government decision makers will need to work closely with the private sector — including startups and scale-ups — and the community to ensure they are getting full visibility on potential solutions. What this also means is a 360 view of all participants is needed by Smart City conferences, expos and summits. It’s no longer sufficient to bring together Govt. Officials, City Council Representatives, urban administrators and researchers to talk about the smart cities vision and solutions. With this an important part of the jigsaw is missing. The community, engaged citizens and private enterprise - including startups and scale ups - also need to be part of the conversation. Government as an ecosystem stimulus: Government may find itself moving beyond a master-planning approach i.e regulating, convening and purchasing decisions and instead position themselves as ecosystems activators. Disruption on the horizon for new and established players: “Smartness” is not just retrofitting traditional infrastructure or streamlining operations. It’s about using technology and data “to make better decisions and deliver a better quality of life”. In short, smart cities will “disrupt some industries even as they present substantial market opportunities” and move the value throughout the value chain. This will mean a need for a change of doing business by established players such as wanting to move into smart city solution (e.g engineering design companies, infrastructure developers, logistics) one that encompasses new financing models, new business models, new skill sets and new ways of doing business. Companies looking to enter smart city markets will need different skill sets, creative financing models, and a sharper focus on civic engagement. It’s all about the journey: Becoming a smart city is about the journey not the destination. The entire reason is to engage, include and respond dynamically to the needs and desires of residents. Smart cities need smart government — and governance. People at the center: We love this point. Smart city technologies have the potential to place people at the center. To enhance connections and understanding about community. So, where does Snobal’s solutions intersect in all of this? We think it’s best explained using the springboard of the MGI diagram (pp.12) which outlines three layers of smartness in smart cities. And here is our take on the above. Smart cities are at an exciting time of development and so too are emerging technologies. It is a period of rapid change, learning and exploration. At Snobal we see emerging technologies such as AI and VR providing the ability to democratize design (between designers and end users), to enhance communication (between key stakeholders, decision makers and the community) and enrich understanding of complex environments and city data. It is a human centered way of approaching the design and future vision of our cities. Placing citizens at the center of smart cities and not the target. What do you think? Would love to hear your thoughts on smart cities and what the future holds.